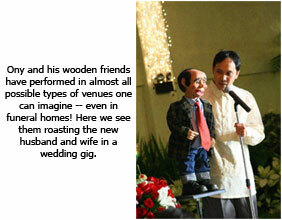 Ony Carcamo is quite simply the best and the busiest working ventriloquist in the Philippines today. Period. Since 2000 he has been entertaining (and most of the time educating, too) his Pinoy audience, young and old, in malls, comedy bars, hospitals, schools, clubs, cruise ships, parks, zoos, hotels, churches, living rooms--even in funeral homes! In 2001 he was lauded by the government--through the National Commission for Culture and the Arts--for his outstanding talent and contribution to the local theater arts and for helping revive (and reintroduce to a wider public audience) a dying art form in the country: ventriloquism. 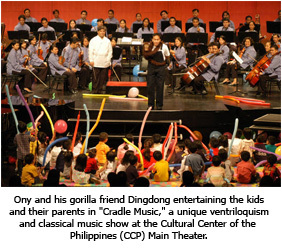 Ony is the first ventriloquist to have performed in the huge Cultural Center of the Philippines Main Theater (Tanghalang Nicanor Abelardo). He is the first local ventriloquist to have hosted a national radio talk show (in NU107 FM)--with his puppets as co-hosts! He is also the first local ventriloquist to have developed and toured an educational ventriloquism and puppetry program that has been entertaining and educating tens of thousands of schoolchildren about significant topics. Ony won third place in the international 2008 Axtell Puppet Video Challenge--Ventriloquism Division, judged by some of the best ventriloquists and puppeteers in the world, including "America's Got Talent" favorite finalist Kevin Johnson and Tony Award winner and American TV sitcom classic "SOAP" star Jay Johnson. Before becoming a professional entertainer, Ony had worked as scriptwriter (of TV sitcoms, like "T.O.D.A.S. "), cartoonist, journalist, and editor. For about a dozen years, he had been an advertising copywriter/creative director for top ad agencies such as McCann-Erickson Philippines, Basic Advertising, FCB, and Publicis-AMA. Ony is a multi-Palanca award-winning short story writer, playwright, and poet. He has two published books--Ang Batang Nangarap Maging Isda (UP Press, 2006), a collection of his poems, and Ang Mga Tsismis sa Baryo Silid (Lampara Books, 2009), a story for children. He currently still writes professionally. Ony got interested in ventriloquism because of the legendary showbiz icon Jun Urbano, better known as Mr. Shooli. He had worked with Banong (another nickname of Urbano) for a number of TV commercials (Ony as copywriter, Banong as director) since the early 90s. He learned that Banong used to do vent and, in fact, owned a precious vent dummy: a century-old black wooden figure named Kiko originally used by his father, the late Manuel Conde (the original "Juan Tamad"). They talked about ventriloquism and Banong even let Ony borrow Kiko for about a week so he can take a closer look at the figure and possibly practice with it (though it had defects at that time). It was then that Ony took up the craft seriously and never looked back. When Ony was performing in the Comfort Room comedy bar in Makati (at one point six nights a week! ), Banong had a chance to watch him. After his act, Mr. Shooli even gave him valuable critique.